ORPHEUS is a completed European Commission HORIZON 2020 research project that pioneered the development of an end-to-end object-based media chain for audio content. Object-based media is the ultimate approach for creating and deploying interactive, personalised, scalable and immersive content. It allows media objects to be assembled in novel ways to create new and enhanced user experiences, being responsive to user needs as well as environmental and platform-specific factors. Examples are the adaptation of the dialogue level, the flexible playback on any end device or the variable length of a program. This technology is also an essential component for Radio/TV/Online cross-media demands. Moreover, it enables the transition from linear to non-linear and both on-air and on-demand listening, using broadcast and IP technologies. The ORPHEUS project has created a full set of tools and applications for all stages of the complete broadcast workflow. 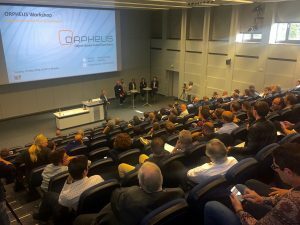 Even more, in two successful pilots, ORPHEUS has proven the unsurpassed advantages of this next-generation audio technology as a universal, innovative and game-changing approach for media production and its applicability in real-world broadcast environments. The project was officially concluded with the 2nd ORPHEUS Workshop at partner IRT in Munich on May 15, 2018. 120 media and broadcast professional came to see, listen and experience the achievements of the project. The event is fully covered here, including slides and videos, on the Presentation Abstracts & Infos on Demos page. All technical details of the project are published and can be accessed via the deliverables page. Or pheus started on 1st December 2015 and concluded on May 31st 2018. It received funding from the European Commission under the Horizon 2020 programme.